The girls were delighted when we were asked if we’d like to review a copy of the DVD of Guess How Much I Love You as we are already fans of the book by Sam McBratney. 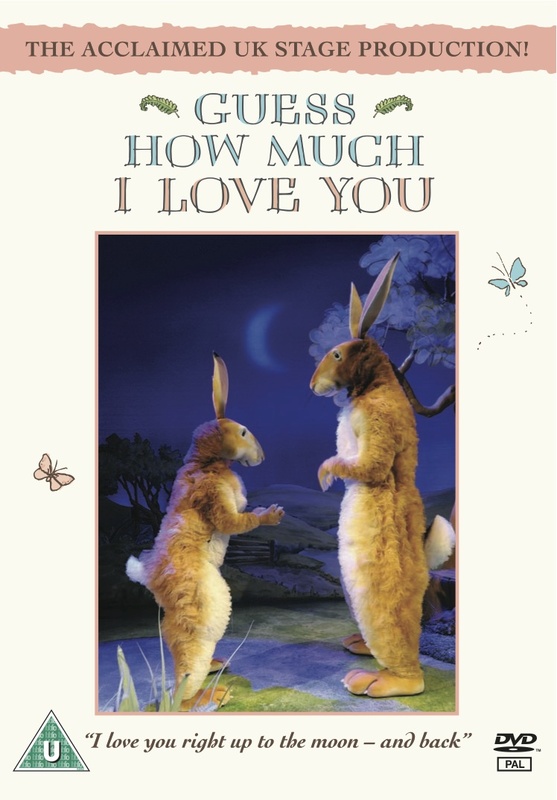 The DVD is the stage production of this much loved classic and shows Little Nutbrown Hare and Big Nutbrown Hare’s journey through the four seasons. Packed full of songs and with some keen audience participation, this DVD is suitable for ages 3 and up, although my 2 year old was fascinated by it and soon picked up the actions to some of the songs. Grace’s favourite part was the song at the end (which we are all still singing!) and Faith loved the two rabbits and their costumes. The DVD is currently on sale on Amazon and Play.com for £9.99 and you can see a trailer of the DVD here. I’ve also been given a copy of the DVD to give away so if you’d like to be in with a chance of winning this please leave a comment telling me what your favourite book is to read with your children. 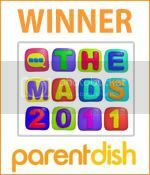 The competition is open until midnight on Thursday10th February 2011, when I will pick a winner at random. The winner will be notified on Friday 11th February so please make sure you fill in your email address in the box when you leave your comment (this will only be visible to me). There is one entry per person and the DVD will be shipped to a UK address only. This is a review post. We were given one free copy of the DVD to review and one to give away. I would love a copy of this DVD for my darling grandchildren – Amy who’s seven and five year old Jessica, who both just love watching animated films. My favourite book to read with them is, “The Night before Christmas”, which is quite seasonal really, but the excitement of Christmas and the visit by Father Christmas is captured so vividly in poetry that the children just love it and never tire of hearing it. The Gruffalo, and The Gruffalo’s Child – not very original, but my two-year-old son adores them both and it’s great to see how into the story he gets. My little girl absolutely loves the tickly monster. When she hears this she giggles like an angel. I used to love reading The Gruffalo to my two when they were younger, at the moment we’re reading Twilight!!! They’re 8 and 9 now!! We love Room on the Broom! An excellent story with great illustrations and my little girl loves to fill in the blanks that I leave when I read the story. We love ‘Not Now Bernard’, It is basically about a boy who gets eaten by a monster, but the parents are always too busy to realise – does this sound familiar!! My kids love the story but they also like the pictures too!! We also love ‘The Shopping Trip’ which is about a boy who gets told by his mum to visit the Supermarket with a list of items which he has to get, but on the way home he gets confronted by various animals who want his wares!! We love Stick Man. Its about a Stick man and his family and one day he goes for a jog then keeps getting mistaken for a stick and ends up far from home, he finally gets home with the help of Santa. Brilliant! it has to be the Grufalo at the moment that is – my daughter was bought it for Christmas & she’s hooked! My son never tires of The Very Lazy Ladybird, we can read it 4 or 5 times a day. My favourits are all the Guess How Much I Love You books though, they always bring a tear to my eye every time I read them. It’s not until you become a mum that stories like that really touch you. I will keep them forever, stored in the box in the attic with all the photos and and drawing the children have made. My daughter loves me to read the Happy Families books to her, our favourite is Mrs Lathers Laundry. My little nieces would adore this. I remeber reading it to my youngest daughter when she was tiny. Her favourites were the Mick Inkpen stories of Kipper which I have already sent to her cousins. Well, Guess How Much I Love You is my fav book to read to them. IT is special to us as we had someone read it out at our wedding. I took Adam to see the stage production when it came to Aberdeen and we loved it. Lots of good songs. Another favourite is called Sixteen Cows but I can’t think of the author right now. There are so many great children’s books. my son’s favourite [and mine!] is each peach pear plum, he loves to say the rhyming word at the end of the sentence and look for the hidden characters. Just love reading the book ‘You Choose’ a really brilliant book for any age of child and one that we look over time and time again. the gruffalo… no, the hungry caterpillar… no, guess how much i love you… errrm no, shark in the park, my friend bear ? tiger, definitely tiger, or maybe old elephant. hmmm…sorry i absolutely give up, there are just too many amazing childrens books and there’s no way i can choose one. My girls and I love rhyming books and books with a good rhythm and books with lots of voices, oh and books with actions, and quiet bedtime books, and noisy anytime books. maybe I’ll have another think and come up with a definitive alltime favourite…maybe! Room on the broom for my 4 year old. My 1 month old hasn’t decided yet but my 8 year old loves Roald Dahl, especially Charlie and the Chocolate Factory. We all love My house is a Squash and Squeeze!! my daughter likes spot, as did I! My younger daughter loves all the Julia Donaldson books (The Gruffalo, etc.). Currently working my way through Narnia with my older daughter. ‘We’re going on a bear hunt’. But when I read it my son corrects me and tells me we’re going to catch a ‘little one’ not a big one as it won’t fit in his bedroom!?! Laura’s Star and The Rainbow Fish are our favourites. It would have to be the Gingerbread Man the kids join in and its a classic read along and have fun story. We have the hutchinson treasury of childrens literature which is brilliant as there are so many old classics and nursery rhymes in it! Do you know I can’t think of any particular book however, I do remember loving those books which you had to choose your own ending. My Daughter loves to read Baby Bear which was a free book we were given by the health visitor when she was a few weeks old. She is nearly 2 and we have read it nearly everyday. Nothing can beat the very hungry caterpillar! I used to read Each Peach Pear Plum, The very hungry caterpillar and also Guess How Much I love you. Would love to win this and hand it down. The Stick Man, though I’m not sure if it’s my four children’s favourite or mine. My children still all love Were going on a Bear Hunt. They enjoy the interactive nature of the book and because its repetitive they have joined it since they were very young. Dirty Joe the Pirate by Bill Harley is good for a laugh! Any Hairy Maclary by Lynly Dodd – such good fun.